Spotted on the Sunshine Coast recently, I thought these Rice Cube contraptions were a novel example of Australian design and ingenuity. Developed by Ross Patten in Peregian Beach, QLD (initially as a clever tool to use on MasterChef! ), these plastic jigsaw pieces are designed to mould rice, or other foodstuffs into a nifty cube shape. If you've got fussy kids (and don't we all), this might be a fun way to get them involved in food preparation. 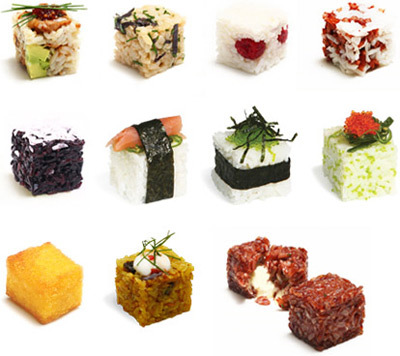 I imagine a wall of rice cubes might be more enticing than a lumpy mound! And for the advanced cooks among us, you could create amazing sushi. Ross even makes risotto, polenta and felafel cubes. And if all else fails, they might end up in the Plahdoh box. Fun! The Rice Cube is Australian designed and made using recyclable food safe materials. 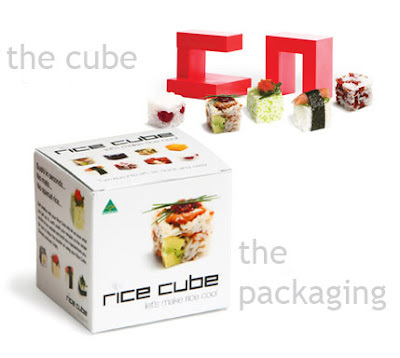 You can find Rice Cubes in the online store. Kari and Ashleigh - I know, looks so fun right? I'm keen to find out if anyone has tried one.